Your making me hungry!!! I could go for a sloppy chili cheese dog and a thick shake! Love the collage...really nice! Thanks Terri. 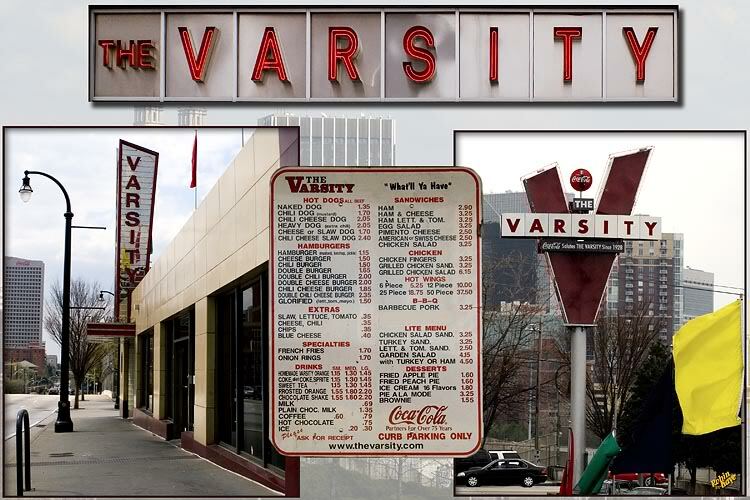 I had a cheese dog, fries and a Chocolate shake with the Original Varsity Orange drink. Sooooo goood. I see they do Korean food. Chili Cheese dog with onions, please!!!!!! I'd forgotten about the Varsity Orange! Thanks again, for pointing this out!!!!! "Memories"!!!!!!! Heart attack waiting to happen, but AWESOME!!!!!!! I have found a place similar here - also with bbq - Dumar's - they invented the ice cream cone, rumor has it!!!! Thanks so much Robin - I really appreciate this & the penguin creamer!!!! I notice they have chicken fingers on the menu. That's what ya get for thinking!!!!! LOL!!!!! !